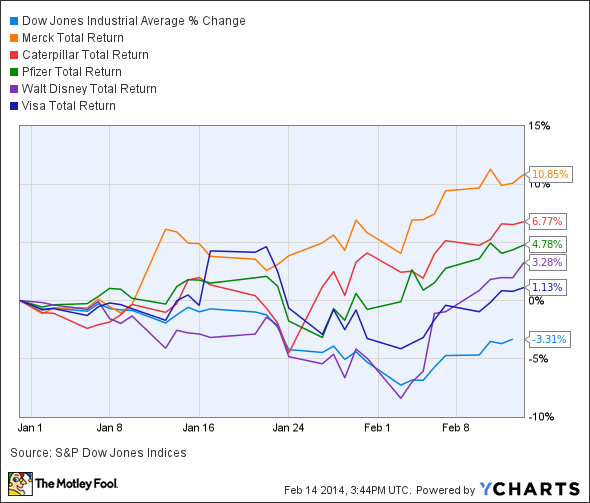 It's been a choppy year for the market, but some important Dow components have held up well in the face of fear. Merck (NYSE:MRK) has led all Dow components, and is the only component thus far to put together a double-digit gain in the young year. Despite a relatively quiet January, Merck headed the Dow for that month on the back of new partnerships, good trial results, and a major analyst upgrade. February continues the trend despite underwhelming earnings, which Fool health care analysts David Williamson and Max Macaluso point out do not encompass the potential hidden in Merck's new collaborative agreements or its long drug pipeline. Investors seem keen on Merck's intensified focus on cancer treatments, but its late-stage trial diabetes treatment is also getting plenty of market attention in 2014. Caterpillar (NYSE:CAT) is thus far the only industrial-sector Dow stock in positive territory for 2014, and this comes after a weak 2013 in which it was one of the index's worst performers. The reasons for Caterpillar's weakness last year actually seem to be on its side in 2014, as several important commodities clawed out of the earth by Caterpillar's mining machines have been on an upswing. However, Caterpillar's latest earnings show otherwise -- the company's mining segment is likely to see a drop in its top line this year. Caterpillar's belt-tightening efforts should help it stay profitable, but this year's bounce seems as much an indication that the stock hit bottom in 2013 as it is a sign of impending revival. Pfizer (NYSE:PFE) is the Dow's third-best stock this year, and it's also the index's second-best (out of two) pharmaceutical components. That's probably no coincidence -- investors simply don't seem to care that Big Pharma (of which Pfizer is the biggest) experienced a challenging year as blockbuster drugs went off-patent without anything similarly noteworthy to replace them. Pfizer's fourth quarter showed a steep drop in net income, but the upside is that two promising drugs might soon bring windfalls. Pfizer's pneumonia vaccine could in short order be allowed for use on elderly Americans, and its breast cancer treatment palbociclib should soon begin late-stage trials. These drugs might not fully offset the billions of dollars Pfizer has already lost to generic competition, but investors don't care, especially considering that Pfizer has the best net margin of the Dow's 30 components. Disney (NYSE:DIS) was one of the Dow's best stocks last year, and it shows little sign of slowing down in 2014, especially after reporting blowout earnings -- a rare feat for Dow components so far this year -- that highlighted the massive success of Thor: The Dark World and Frozen. The company's earnings grew 32% year over year, and the Captain America sequel looks set to become a blockbuster as well. The company also continues to be a theme park superstar, and major expansions could bring millions of new visitors over the coming years. A big tie-up with Netflix (NASDAQ: NFLX) has already generated much excitement for upcoming Marvel shows and for a new season of the Star Wars series The Clone Wars. Disney stands out as the only truly consistent growth story on a leaderboard full of long-term optimism and near-term weakness. Visa (NYSE: V), one of the Dow's newest additions, rounds out the top five by narrowly eking out a positive gain on the year, but it wasn't until reporting earnings at the end of January that the credit card giant finally left the Dow behind and began to climb higher. Investors liked the company's double-digit earnings-per-share gain, which was buoyed by better margins, as revenue was only 9% higher. Visa has historically been a play on the American (and global) consumer, and as long as consumer trends appear positive, the company and its shareholders are bound to benefit. Fool contributor Sean Williams highlights some of Visa's other advantages as a long-term holding, and many of those will be very difficult for upstarts to replicate -- another reason why Visa's shares have consistently outperformed the Dow since it went public in 2008.